Sometimes the Universe rings a small bell when it’s time to make a change. Sometimes that bell chimes loud and clear. 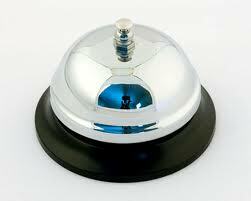 We’ve given my mom a service bell to ring when she needs something. That bell rings a lot. I was on duty last night so I’ve slept a total of about 3 hours. My mom was up all night. She refuses to eat so she is very weak and can’t walk, but this doesn’t stop her from being stubborn. She’s tried to get out of bed twice, and fallen both times. That’s bad on two levels. Obviously a fall is dangerous for her, which is why we never leave her alone, but even with us here, she is still at risk. Because Mom is still very heavy, neither my sister or I can lift her alone (Clare has a bad back and I have a shoulder and wrist injury). Together we can barely wrangle her back into bed. So much for either of us taking the night off. It’s time to seek professional help. We had hoped to wait until we got Medi-cal assistance to move Mom, but we can’t wait. Her health and safety is at risk, as well and our own health and sanity. It’s time to answer the big bell.